I consider myself a pretty cautious person, when it comes to handling my finances and trying to keep my money safe. So you may be surprised to hear that I have been the victim of a few financial scams in spite of my caution. And even though I would never send my financial details to a Nigerian prince so he can deposit millions into my account, there are things I just didn’t see coming. For example, my credit card was cloned once. That was abroad, and it was common for the waiter or the gas station attendant to leave with your card and go swipe it in the back office. One of those nice gentlemen decided to make a copy of my card. Thankfully, I was withdrawing money in Paris the day they decided to withdraw money “in Colombia”, where I had never set foot. The swipe happened in Mexico. I don’t know how people do it, but they do. So you really want to take protect your money the best you can. There was also that time when I went to withdraw money from the ATM, the machine gave me £0 and yet thanked me for my business as if I had gotten my money. My bank, Santander, was really awesome about it, as you can see in that post they made me a happy customer. Most credit cards have fraud protection built in, and if someone uses your card without your consent, the bank will refund the fraudulent purchases. In my case it was easy because I wasn’t even in the same country, but if it is due to neglect and the bank can prove it, you may have to pay for it yourself. There are also the fake emails you receive about a “technical problem” with your online banking account, or some other weird thing, that asks you to click a link, and fake log in to your online banking, so they can get your log in details and wipe your accounts. I never fall for that one, but I can imagine how an older person who is not really familiar with all those “internet things” could be a victim of that kind of scam. 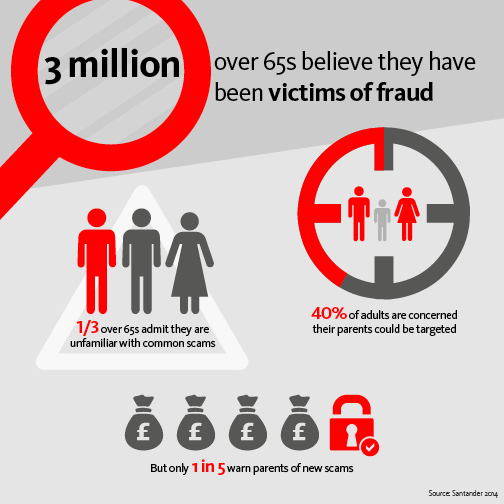 As the infographic above shows, people over 65 are less familiar with financial scams, and their families are not really doing a good job at educating them about it. I remember a lady when I was working at a restaurant, that we charged something like £1,200 for a meal instead of £12, by forgetting to insert a coma. She came back and said she was really lucky, because she always had a high balance on the account, and never checked her statements, so that big wrong purchase could have gone unnoticed, but that time she had decided to have a look at her monthly statement, and thought it was really weird to spend £1,200 at a fast food. While the person who charged her card did it with no evil in mind, you may be the victim of those kinds of frauds too. A common one is a £12 bill and a £250 tip added by the waiter. I get annoyed when the bank checks on me to see if I really made a payment to X for £Y, but they really have your interests in mind, so next time I will try to be more patient and remember those frauds.